Let's not have White Supremacists take over our streets and spread their hate! If you ever felt helpless and wondered how you can stand up against hate, here’s an easy and efficient way to counter-act hate with immediate action. 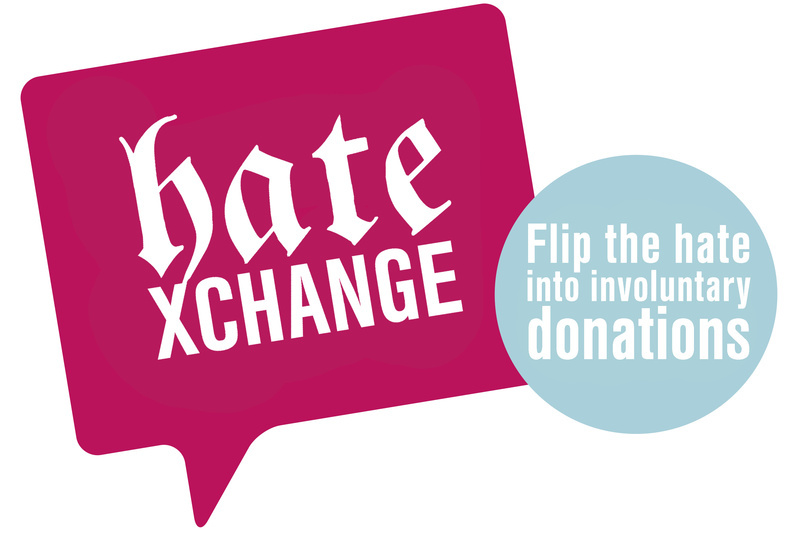 HateXchange will flip hate into involuntary donations. How?, you ask: Have the haters raise the money for you! Each time Nazis show up to march, they will raise $1 per person marching. The funds will be used to help organizations fighting hate, bigotry and xenophobia, helping those who are looking to leave the right-wing scene, because the far right is not the right way. For more read the post. What are we doing, and how and why does it work? It all began in Wunsidel, a small town in Germany that was tired of Neo Nazis flooding their town every year to march in “honor” of one of Hitler’s deputies who is buried there. Locals pledged to donate for every meter the Neo Nazis marched. Instead of counter-protesting and waving the usual anti-xenophobia signs, the Neo Nazi march itself was put to use in a catch-22 way: Its participants were involuntarily raising money against their own cause simply marching every single meter of their rally route. Locals hung and waved fun colorful signs and banners using puns as a play on right-wing verbiage, and the Neo Nazi march was turned into a mock sports event with a start and finish line. The brave marchers were thanked for their efforts in fundraising against themselves by receiving a certificate of participation. HateXchange is an initiative of C.H.A.N.G.E Inc. a non-profit organization fighting right-wing extremism located in Memphis, TN. HateXchange is the official partner of EXIT Germany and EXIT USA (an initiative of Life After Hate and sister organization of EXIT Germany) Both EXIT Germany and EXIT USA fight far right extremism, help people leave the White Supremacy movement and help them to change their lives for good. Help us raise a starting fund to help flip hate into involuntary donations! If 500 White Supremacists show up and rally for 3 hours this will translate into $90,000 to fight against their own cause! You can help us get started and it doesn’t matter how much you give. Your dollars will directly create something positive from something negative and will send the message that there is no room for hate in this country and that we will use every penny to fight extremism! All funds raised will go to hateXchange to help form campaigns like this in EVERY city the White Supremacists are showing up! Follow us on Facebook and Twitter to learn more about upcoming campaigns and how you can soon help fight online hate speech, one post at a time.